A Tiny Summer "Cultural" Festival: Why don’t you join us? Something is strange. I thought that when I was heading for the summer festival site. 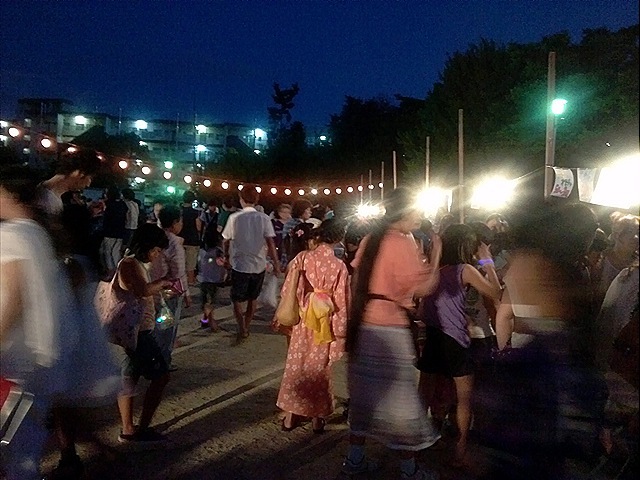 There is a tiny festival in my neighborhood every summer. It was held on August 3rd and 4th this year. I found out the reason why I had thought that something was strange when I arrived at the site. The place was very quiet. You know, festival sites are usually exciting. What’s happening? 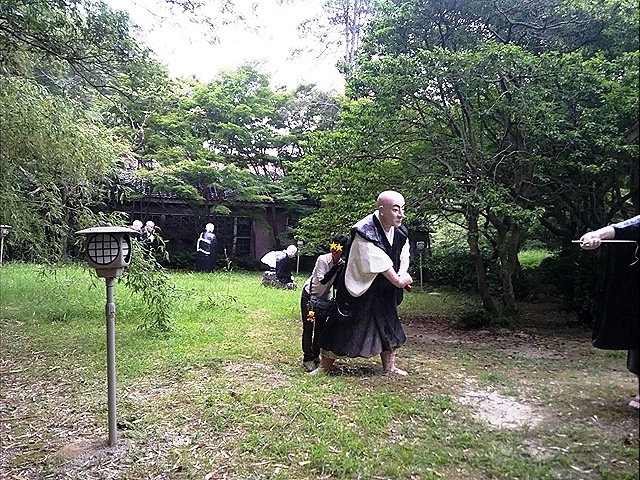 I looked at the stage, where five elderly people were doing something in a quiet manner. What are they doing? 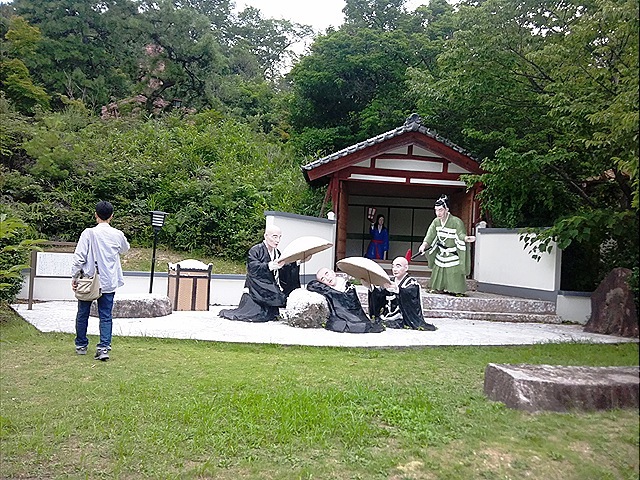 Two women were playing the three-string instrument called shamisen, and other two women and a man were singing. It was music, but was not a contemporary one. 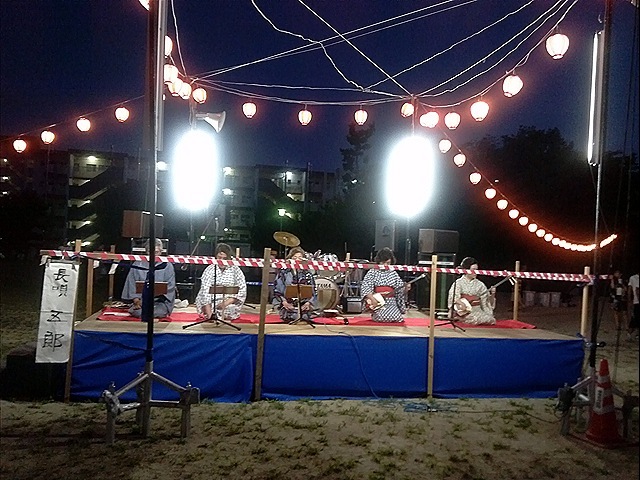 They were playing a kind of traditional music in the Edo period “Nagauta”! 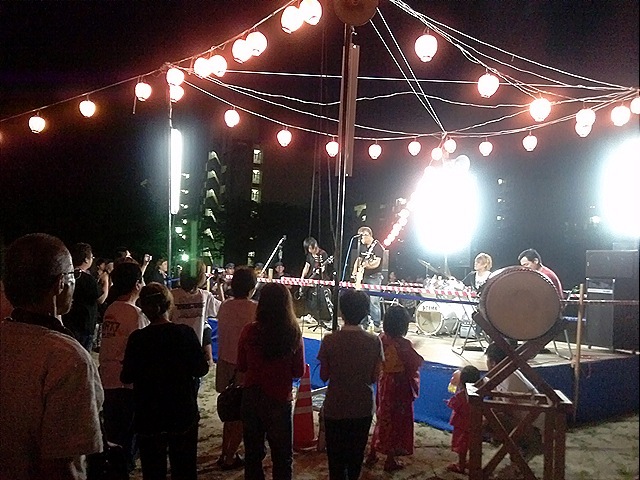 This summer festival started solemnly. The next performance was in complete contrast a rock band’s music. Interestingly, the band was consisted of young boys and their father-looking middle aged men. They brightened up the atmosphere at once. Many festival goers surrounded the stage and danced in a frenzy of excitement. Wow! I saw some elderly women also dancing. After the feverish staging, a dance unit named Tsubasa appeared on and around the stage. They are more than 20 dancers and perform at some major festivals such as Domatsuri in Nagoya as well. All of the dancers are my neighbors: from elementary school students to middle aged people. They danced to some their original music. Their energetic performance made the festival atmosphere sensational. 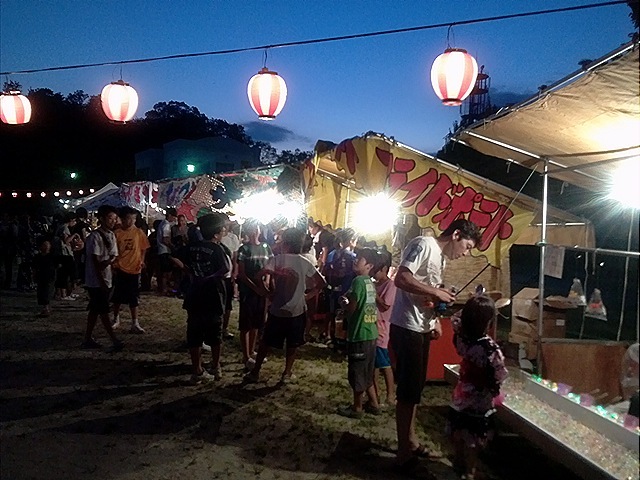 In Japan’s festivals, stalls are very important: shaved ice, grilled squids, takoyaki, okonomiyaki, French flies, goldfish scooping, water balloons hooking, etc…Many children were rollicking around the stalls holding coins in their hands. They wanted to buy some junk foods and toys which looked chintzy during the daytime. Under the spell of the festival, everything looks sparkling for kids. Of course, I was that kind of child. Actually, the festival used to be called a bon dance festival. 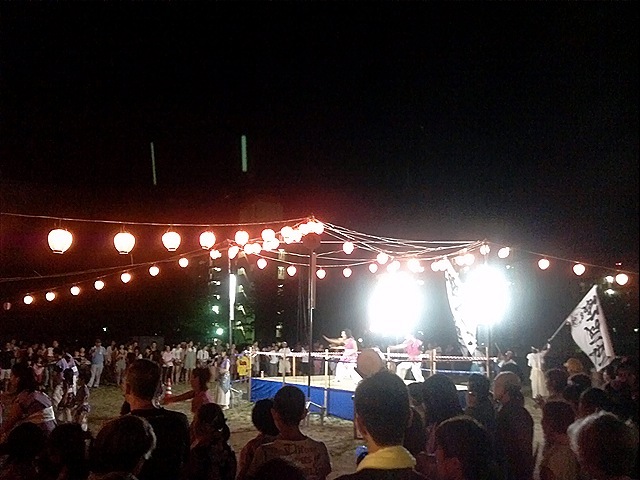 At bon dance festivals, people usually wear yukata, or cotton kimono for summer, and dance the same dances together to well-known Japanese folk songs in a circle. We stopped having bon festivals several years ago because of the aging population, the diminishing the number of children, internationalization, and diversification of personal interests in our area. The number of the participants at the bon dance festival decreased year after year. Because of this, the number of the stalls also lessened. The festival had difficulty surviving. But the festival in my neighborhood was revived as a cultural festival several years ago. You can dance, sing, play music, magic, anything you like at the festival. Not only many neighbors have come back but also some people have joined the festival from other areas recently. 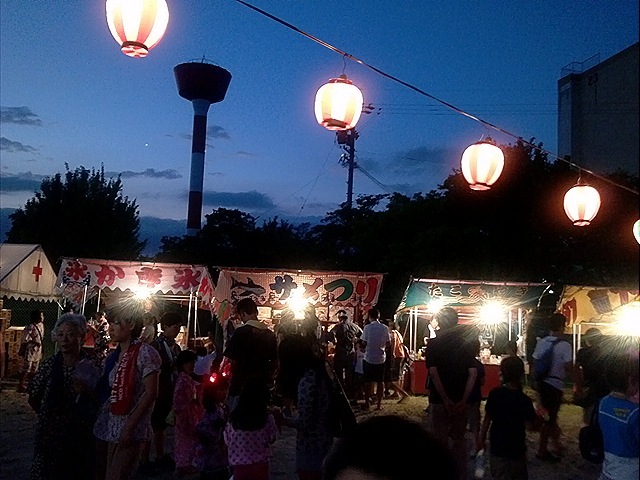 The festival isn’t as big as it used to be and some Japan’s summer tradition has been lost, but I think it’s wonderful that many neighbors can get together and have a wonderful time together once a year. Why don’t you join use next summer? Ko-san came with his friend Tomo-pu to my neighborhood. It was my first time to meet her, but we felt comfortable with each other and became friends soon. 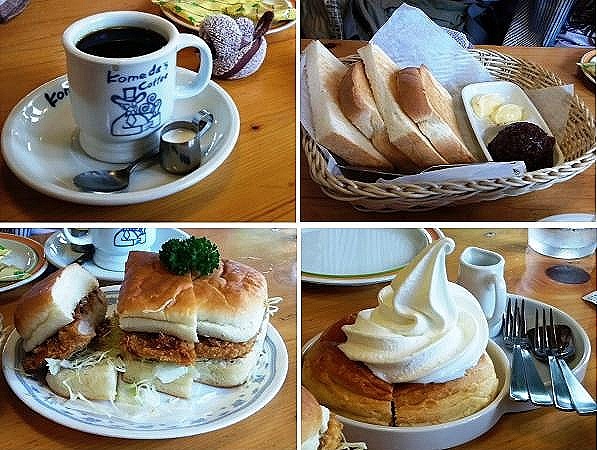 Before visiting Goshikein, we went to Komeda, a famous store chain café in Nagoya, and had two of the local specialties and one of the café’s original menus: Ogura–Tōst (sweet bean paste and toast), Miso-Katsu-Sando (pork cutlet with miso dressing sandwich), and Shiro-Noir (hot Danish pastry and ice cream). Those foods were very nice. Why don’t you try them if you come to Nagoya? After the pleasant lunch time, we went to Goshikien. Yasugon, a mutual friend of Ko-san and I, also joined us in the middle of the tour. Reading this far, most of the readers might be thinking, “So, what’s Goshiken?” Goshikien is a kind of theme park. But it’s not a usual one. The theme is Buddhism. But the place has few Buddha’s images. 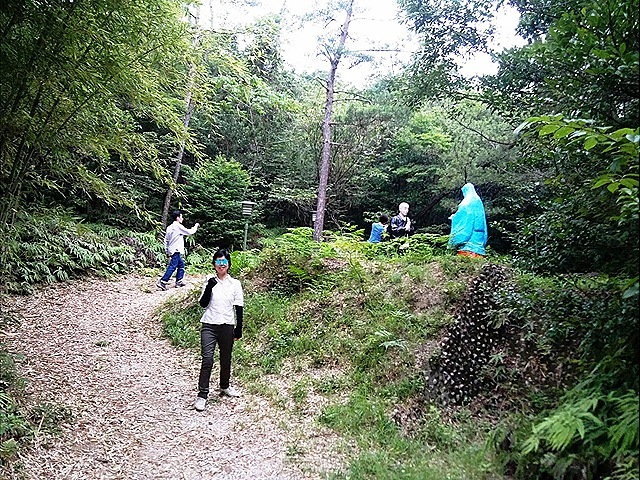 Instead, there are nearly 100 statues of people and monsters in more than 65 hectares of land. I’ve never seen all of the statues because the place is too big. This theme park was established by Daianji Temple on its property in 1938 to enlighten people on Buddhism. 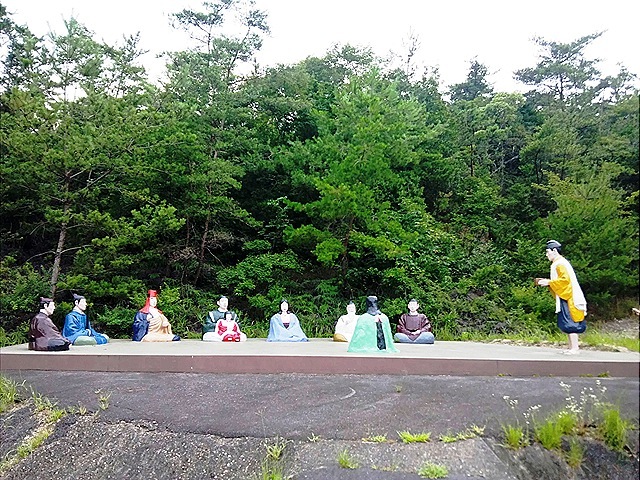 It represents with huge concrete dolls the life of Shinran, who was a Japanese Buddhist monk in the 13th century and the founder of a sect Jodo Shinshu. 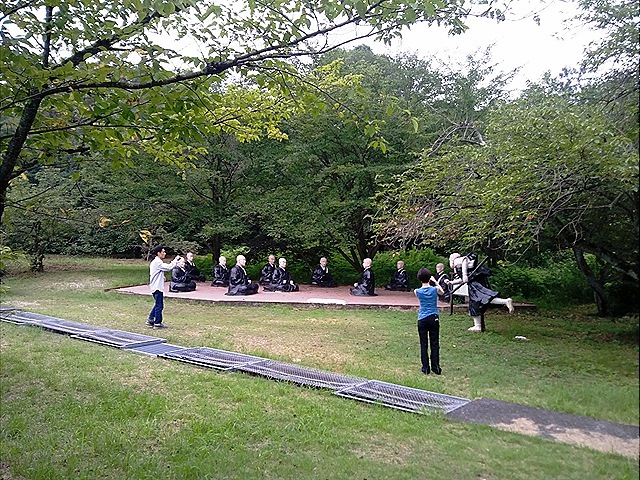 Those statues were made based on some famous episodes in Shinran’s life by a local artist Shoun Asano. In spite of its amazing grander and its large scale plan, few people visit there. So, if you go to the place alone in poor weather, you might be a little scared. But the two people from Tokyo seemed to enjoy the place. Good! I always just look at some of the statues whenever I visit there. But it may be interesting to follow the story of Shinran as appreciating the big dolls. Maybe I’ll try to visit the park with MANY of my friends in GOOD weather and to find all of the statues someday. "Hosono Paper" – A Report about Nuclear Fuel Reprocessing – Part 2: "It’ll just heighten chaos." 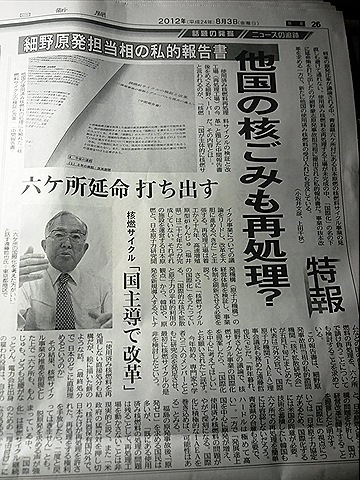 This is the continuous article (the former one is here: http://wp.me/p16bjt-nv) about a report of Japan’s nuclear fuel reprocessing project written by a private consultative body of Minister Hosono (for the Restoration from and Prevention of Nuclear Accidents). The original article on the Chunichi (August 3) is written in Japanese. 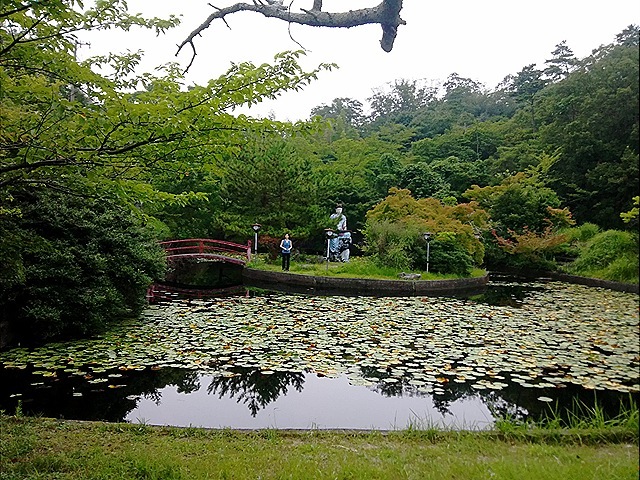 Let’s look at the environment in East Asian countries on the assumption that the nuclear fuel reprocessing plant in Rokkasho-mura of Aomori Prefecture will accept their spent fuel. Korea currently has 23 nuclear reactors in operation. They have planned to construct about 20 more reactors and to raise the ratio of nuclear power generation up to 59% by 2030. It is an immense challenge for them to dispose the spent nuclear fuel. Yonhap News Agency, the largest news agency in South Korea, reported last month that Korea Hydro and Nuclear Power Company had agreed to call on the U.S. to admit reprocessing used fuel in Korea. The U.S.- Korean Nuclear Power Pact will decide about the handling of Korea’s spent fuel in two years because Korea imports the nuclear element of uranium from America. If Korea could get the permission to reprocess their used fuel domestically, they would have at least two merits: 1) They could manufacture nuclear fuel by themselves, and 2) it would discourage North Korea, which is moving ahead with nuclear development. But the U.S. is showing reluctance to admit it because they are concerned about the possibility of Korea’s nuclear development. There are 15 nuclear power plants operating in China. They will construct more 26 facilities and have a total of 41 nuclear power reactors in three years. They are going to reprocess their spent fuel independently and to build a reprocessor with Areva SA in France. Taiwan has 6 plants and there are some possible countries and areas in Asia, such as Vietnam which has decided to import reactors from Japan, to ask Japan to dispose their spent nuclear fuel. But the reprocessing plant in Rokkasho-mura has not completed yet in spite of spending about 2.2 trillion yen. Japan Nuclear Fuel Ltd. announced on July 27th that they had finished the final test to encase high-level radioactive liquid waste after reprocessing in glass. They may solve some technically difficult problems at last, but will not be able to start to operate the reprocessor in October which is their target month. They have not completed the plant for MOX (plutonium-uranium mixed oxide fuel), either. Besides, reprocessing itself has uncertain prospects. The government provides guidelines about the ratio of dependence on nuclear energy in the future and will choose one of these: 1) 0%, 2) 15%, 3) 20~25%. If Japan chooses 1), we will not have any reasons to maintain the reprocessing plant. And if it chooses 2) or 3), we will not only reprocess the spent fuel but also bury some. "Hosono Paper" – A Report about Nuclear Fuel Reprocessing – Part 1 : Reprocess other countries’ spent nuclear fuel, too? 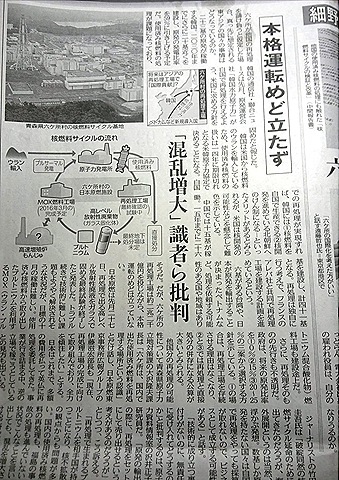 This is an article of the Chunichi (August 3) on a report of the nuclear fuel cycle plan written by a private consultative body of Mr. Goshi Hosono, the Minister for the Restoration from and Prevention of Nuclear Accident. The original is written in Japanese. The nuclear fuel cycle program of Japan Nuclear Fuel Ltd. in Rokkasho-mura of Aomori Prefecture is an unavoidable issue amid the discussion of nuclear power dependence ratio. Despite of the fact that the nuclear fuel reprocessing plant remains incomplete, a report which is an attempt to extend the plan in the name of internationalization has been submitted to Minister Hosono. It demands a drastic reform, but also mentions the acceptance of other countries’ spent nuclear fuel. The report is called “Hosono Paper” and written about the nuclear fuel reprocessing plant in Rokkasho-mura. The title is “The verification and reformation of nuclear fuel cycle”. It claims that the government should lead the discussion about the nuclear fuel cycle program and advance the reform boldly. The nuclear fuel reprocessing plant has not completed yet since it started 19 years ago, and “Monju” the fast-breeder reactor also has not been finished after spending 27 years trying to use it actually. So, the report preaches about the need for the verification of the management structure and the business strategy of Japan Nuclear Fuel Ltd. In addition, it advocates the internationalization of nuclear fuel cycle, and demands considering that the reprocessing plant in Rokkasho-mura can accept spent nuclear fuel from other countries such as Korea and Vietnam, which is going to start nuclear power generation newly, from the viewpoint of international non-proliferation and the peaceful use of atomic energy. Minister Hosono’s private consultative body made the report at the end of May. The leader of the organization is Mr. Tetsuya Endo, 77, who used to be an ex-diplomat and the chairman of the board of the International Atomic Energy Agency. He says, “I suggested the internationalization of nuclear fuel cycle project at an argument with Mr. Hosono at the end of last year, when he asked me to think about it mainly internationalization.” Then he started a study group with other three specialists to examine the issue of the nuclear fuel cycle. “Without reprocessing the spent nuclear fuel, where can we bury them here in Japan?” Mr. Endo and his group members suppose promoting the nuclear fuel cycle project, and suggest that the government should be involved in the management reform because they think that the executive officers from power companies of Japan Nuclear Fuel Ltd. and Japan Atomic Energy Agency have little sense of belonging to their companies in their report. About the internationalization, it will be very difficult. Japan needs the agreement from America because of the Japan-U.S. nuclear energy pact, and Korea won’t agree to reprocess their spent nuclear fuel in Rokkasho-mura since they want to accumulate the technology. Moreover, it is necessary to gain a consensus from Aomori Prefecture, too. However, they think there is a possibility to internationalize the reprocessing by involving IAEA because they believe that the number of nuclear power plants will increase in mainly developing countries and the problems of spent fuel will be more serious in the near future. After the accident in Fukushima, many people are demanding no-nuke society. But Mr. Endo and his group say it is unrealistic not to operate the reprocessing plant because Japan already has lots of outstanding spent nuclear fuel. Besides they claim that Japan is the only country which has got the permission for reprocessing among non-nuclear nations. They warn that Japan would never have the right if the country once let it go. Can “Internationalization” become a rationale for continuation of the nuclear fuel cycle amid growing demand for denuclearization?